Apple on Wednesday introduced the next generation iPod shuffle. The shuffle has always been Apple’s smallest iPod, but now it is nearly half the size of the previous model at 1.8 inches tall by 0.3 inches thin. The new iPod shuffle bumps storage up to 4GB and features VoiceOver, which enables the iPod to speak your song titles, artists, and playlist names. The shuffle can speak 14 languages: including English, Czech, Dutch, French, German, Greek, Italian, Japanese, Mandarin Chinese, Polish, Portuguese, Spanish, Swedish, and Turkish. Greg Joswiak, Apple’s vice president of iPod and iPhone Product Marketing, told Macworld that the iPod shuffle will automatically recognize what language it should speak. If you have a preference of which language you would like, it can be changed in iTunes. All of the controls for the Shuffle are located on the earphone cord, allow you to play, pause, adjust volume, switch playlists and hear the name of the song and artist. The iPod can also give you information like battery life. Apple confirmed that third-party adapters will be available so you can use headphones other than the ones that come with the iPod. The new shuffle also lets you sync multiple playlists from iTunes for the first time. According to Apple, the third-generation iPod shuffle holds up to 1,000 songs encoded at 128 Kbps. Joswiak explained that by removing the buttons Apple was able to make the shuffle smaller, without compromising on other features. 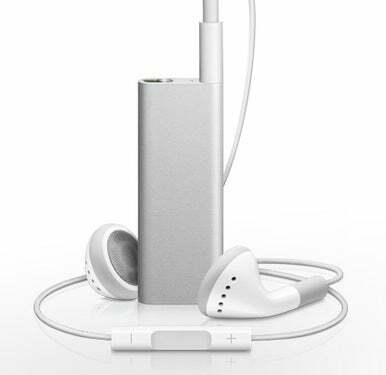 The new iPod shuffle comes in silver or black and features a sleek and design with a built-in stainless steel clip. It requires iTunes 8.1, which hadn’t been released at the time this story was publishing (although Apple’s iTunes download page says the update is coming soon). The shuffle is available immediately and costs $79 (Apple is still selling the 1GB second-generation iPod shuffle for $49).